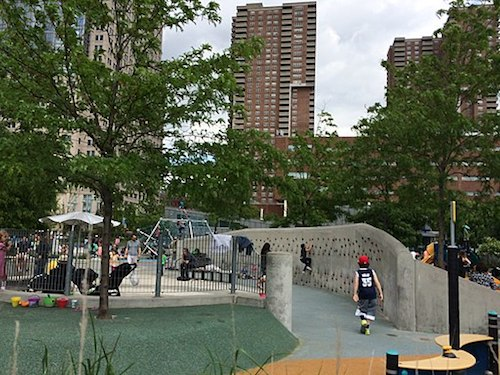 The Hugh L. Carey Battery Park City Authority is seeking contractors for the restoration of the Rockefeller Park Playground in New York City. The park was designed by the architecture firms Carr, Lynch, Hack and Sandell; Oehme Van Sweden; and Donna Walcavage. It officially opened in 1992 as an expansion of Battery Park and contains large lawns, a playground, gardens, several art pieces and a pavilion. The park is named for former U.S. Vice President Nelson Rockefeller, who served as mayor of New York City from 1959-73. The Hugh L. Carey Battery Park City Authority is seeking contractors for the restoration of the Rockefeller Park Playground in New York City. Bids are due for this project by Nov. 29. The awarded contractor is responsible for a detailed survey of the existing playground equipment; dismantling and removal of all playground equipment; restoration of all steel components; disposal and replacement of all wooden components; removal, disposal and replacement of any safety surfacing and/or asphalt/concrete underlying base materials; and final assembly of all equipment. When refurbishing the steel play-unit elements, the contractor is responsible for all in-shop surface preparation, priming and coating. The steel units scheduled to be repainted are to first be cleaned to Near White (SP-10). Once prepared, the units are to be coated with a copoxy-based primer and two coats of a finishing macropoxy. This project will also involve the preparation and coating of the existing steel fence, gates and handrails. These items are to be cleaned by Hand Tool (SP-2) and Power Tool (SP-3) methods, then coated with one coat of an acrylic primer, a second metal primer coat if they’ve been previously painted and two coats of a semi-gloss alkyd finish. The contractor will also be responsible for the application of an epoxy-resin bonding system and anti-corrosion coating system to spalling and/or cracks on existing pre-cast concrete tables and seats. Owner-approved brands are Sika, Sto Concrete Restoration or an approved equal. The project will also involve the installation of new asphalt pavement underlayment and a poured-in-place safety surface made up of a non-porous thermoplastic aliphatic polyurethane system. The finish texture is to be a pebble grain. Owner-approved brands are Sherwin-Williams, International Paint and Carboline. Reported by Paint BidTracker, a construction reporting service devoted to identifying contracting opportunities for the coatings community. Try Paint BidTracker free!